We are a leading Manufacturer of telescopic belt conveyor, dockless truck loading conveyor, flexible powerised roller conveyor and flexible gravity roller conveyor from Pune, India. Conveyor Stand	 MS with powder coating. Elongated Length	 As Per Requirement . Total extended Length	 As Per Requirement . Conveyor Width	 As Per Requirement . Conveyor Input Height	 As Per Requirement . Conveyor Output Height	 As Per Requirement . Conveyor Type	 Telescopic belt conveyor . Belt Material	 PVC anti skidding belt . Back Length	 As Per Requirement . We are offering wide range of Telescopic Belt Conveyor. 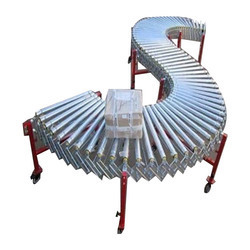 These types of conveyor are used in various industries. Belt Material	 PVC anti skidding belt. Component to convey	 Carton boxes, Totes, Crates. We are the manufacturer of Dock Less Truck Loading Conveyor which we are given to our client. Conveyor Frame	 MS with powder Coating. Components to convey	 Cartons, Totes, Crates. We are engaged in Flexible Powerised Roller Conveyor which we are given to our client. We are offering our client a varied range of Flexible Gravity Roller Conveyor which are used in many industries. 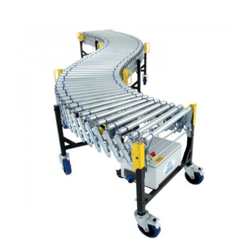 Looking for Warehouse Handling Conveyors ?